I thought this post would be appropriate. My first purchase was a lovely red & white toile curtain. I loved the curtain, but the deep red with my blue walls just wasn't doing it for me. It was a cheerful and happy red that I needed. 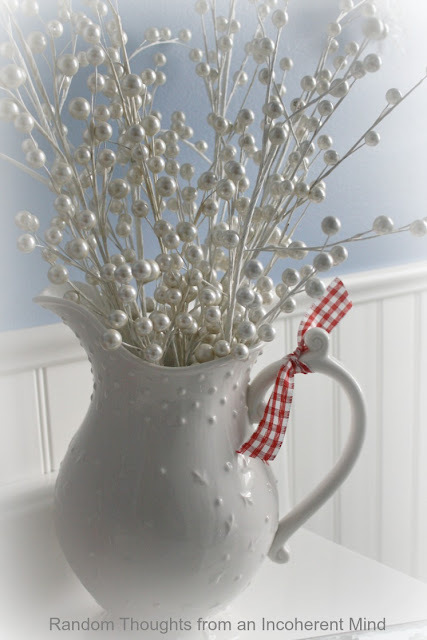 My second purchase was a red & white polka dotted curtain. It certainly was cheerful and happy, but man it was just red overload! 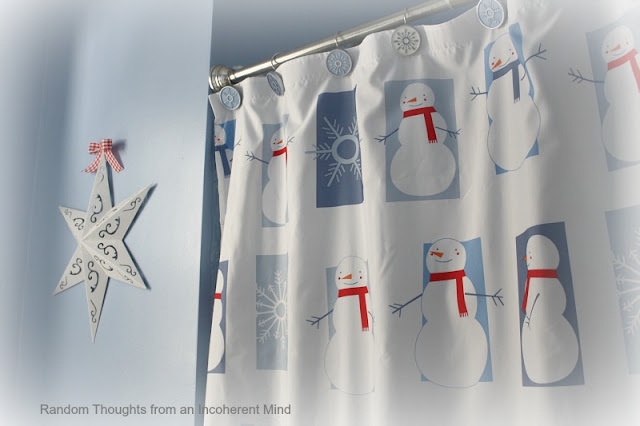 One day, in early December, I was shopping in Kohls & spied the cutest snowmen shower curtain. The snowmen were wearing red scarves. Hmmm, I thought to myself. Perhaps I need to add just a touch of red instead of a full-on blow-out of red. But wouldn't it be silly to buy a shower curtain just for Christmas? Do I really want a themed bathroom? With closer observation, I noticed the snowmen weren't really Christmas-y snowmen, they were more Winter-y snowmen. Along with the fact that Winter lasts until March (or April...or May...) in these parts, I could use it well past Christmas. Between the sale & coupon, it would only be $12.00 & change, so why not have a little fun? Turns out that just a touch of red was the way to go. My favorite shelf with a touch of snow & a touch of red. Have I ever told you how much I love red & white gingham? And that, my friends, is my Winter bath! I appreciate your visit oh so much! When everyone wants winter to go away, you are bathing in it! That's why we love you! That shower curtain is the perfect splash! Hopefully this is the last big one!! Love the touches of red!! Gina - that bathroom is adorable! I cannot imagine anyone not liking gingham in any color, especially red! I would love a little snow - real or not. However, maybe, not as much as some of you are getting these days! Stay warm! I LOVE the touch of red with it! So classic looking. Your bathroom is great. I love the red bowl on the white shelf. It really pops when it is given prominence. I live in southern California so I can't picture winter until April. I am complaining that it is in the 50s lately and I am cold. If I did a blog post on that, I think all the comments would be "shut up and stop complaining". Absolutely love it! This is an adorable little room anyway, and the bits of red just look perfect! What a darling little bathroom that is! I think your snowman shower curtain is adorable and a perfect theme for all the storms on the east coast right now! Very pretty Gina!! Those snowmen are super cute and I love that shelf! Perfect pops of red, Gina, and the blue in the shower curtain looks wonderful with your paint color! I love it! We are suppose to get some fluffy white stuff but it's not making me want to make my bathroom cute. Oh it looks so pretty-just the right amount of red! Hope you're safe & warm! Aha, the snowmen with red and shades of blues is perfect, I'm jealous. You couldn't have nailed it better girl. Love your bathroom, so refreshing. Everything on your shelf and other areas is perfect. Lots of snow where you live huh? We had lots too until last week then it warmed up, melted the snow and we now have a mud bog in yards. YUK. And a very dirty dogs feet when he comes in. It snowed early this a.m. but by afternoon it was all gone again, more mud. Give me the cold temps and snow please, so much cleaner and a happier dog. We have to keep old towels by doors and get ready to wet them to clean dogs feet and he hates it. Love gingham in room also, love gingham anywhere. 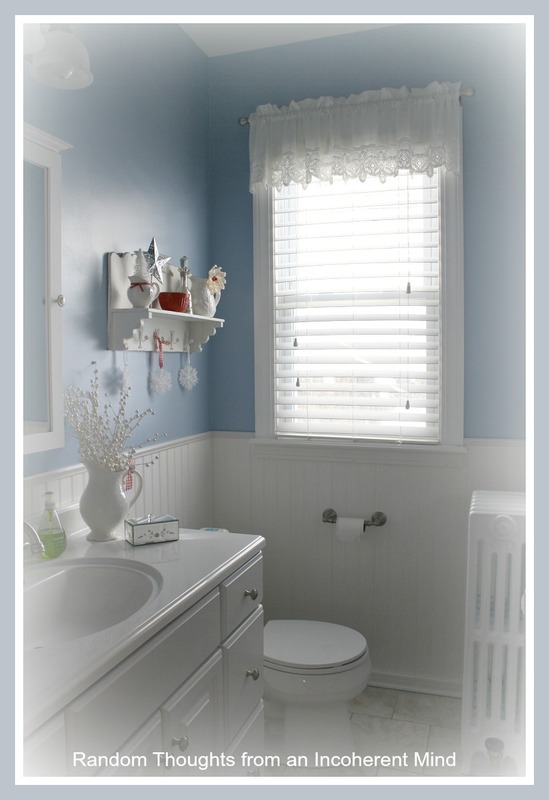 Ahhh your bathroom looks so adorable Gina. I hope that fluffy white stuff is gone, or does not stick around too long. Very cute. Love the snowmen. Gina, The shower curtain is adorable! 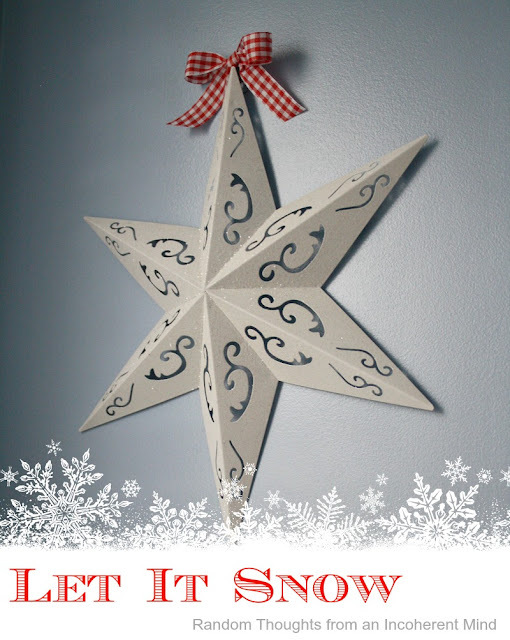 All of your Winter decorations are wonderful. love the touches of red! you know how to do it!!! It's so adorable, Gina! 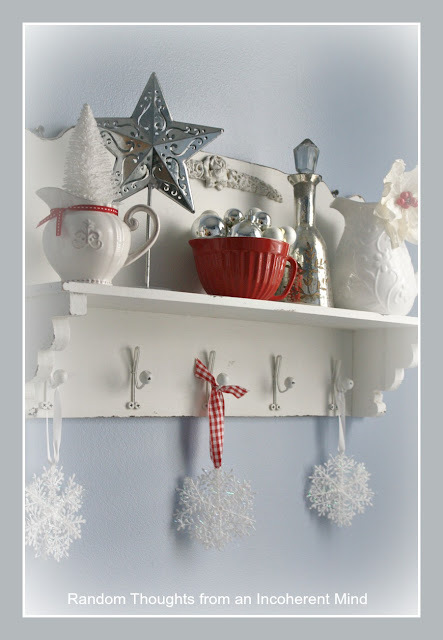 I love the touches of red gingham that you put on the shelf too. I'm a sucker for red gingham also. What a cheery room! I am such a sucker for gingham and wish I could figure out how to put some in my home. Love the hits of red. Love it! Everything looks so happy and cheerful! Good Evening Gina, Your shower curtain is so sweet....and like you I love the colour red. I'm also a fan of red and white gingham. Your bathroom is quite lovely. Oh Gina, it's perfect. I love, love, love it. Just the right amount of red and cheer. And you know how much I love snowmen...so two thumbs up. Oh, Gina! I love your bathroom! I think all the touches of red are just perfect. I love the display on your shelf. So pretty!